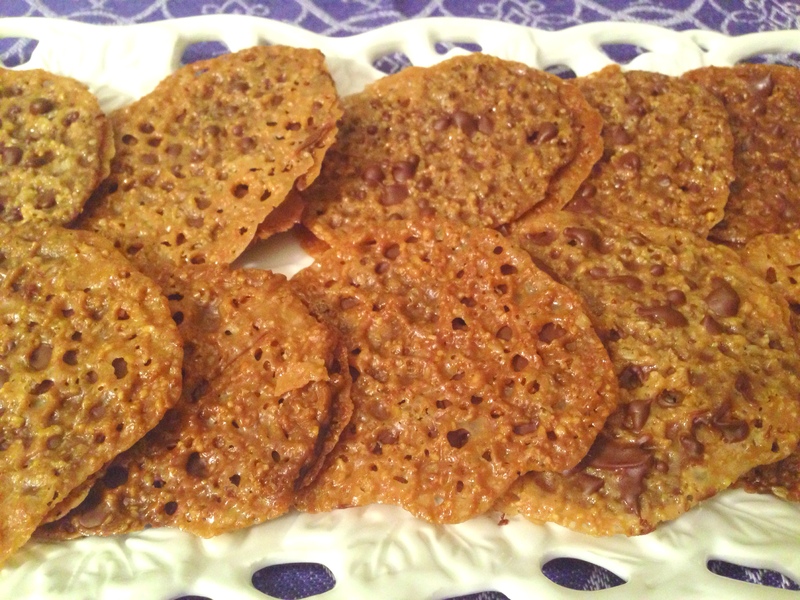 Lace Florentine cookies filled with chocolate are a one of my favorite cookies. The caramel flavor is sweet and well, a little bit addictive. It’s hard to eat just one. This version of the cookie is made gluten-free using a mix of pulverized oats and almond meal to combine with a homemade caramel sauce that forms a batter. I have used steel-cut oats and Quaker oats and both work fine. I would not recommend using quick cooking oats, as the oats are thinner and the quantity might not hold up for the batter. 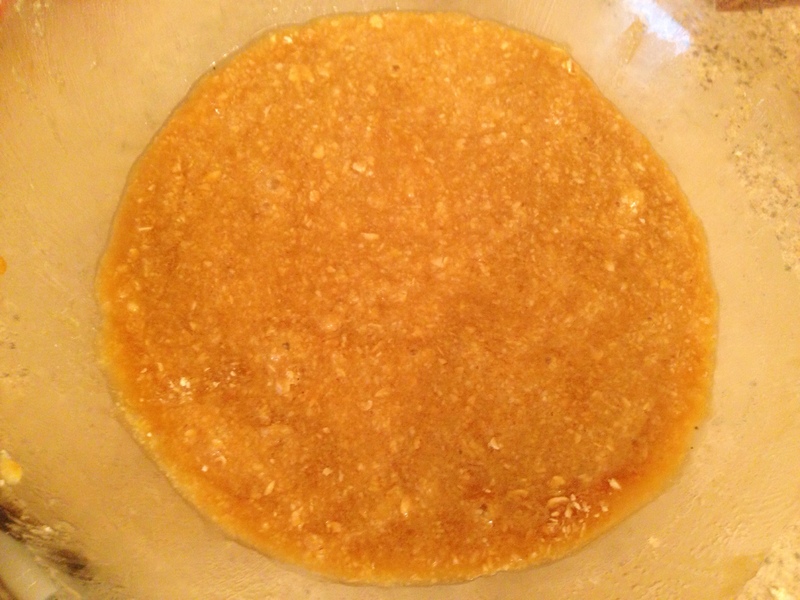 To make the batter, add the oats to a food processor and process until it looks like a meal, about 1-2 minutes. Add to a large bowl along with the almond meal and salt. In a heavy saucepan add the butter, brown sugar, sugar and cream until the butter is melted and ingredients are mixed through. Heat the mixture, stirring constantly, until the sides start to bubble. 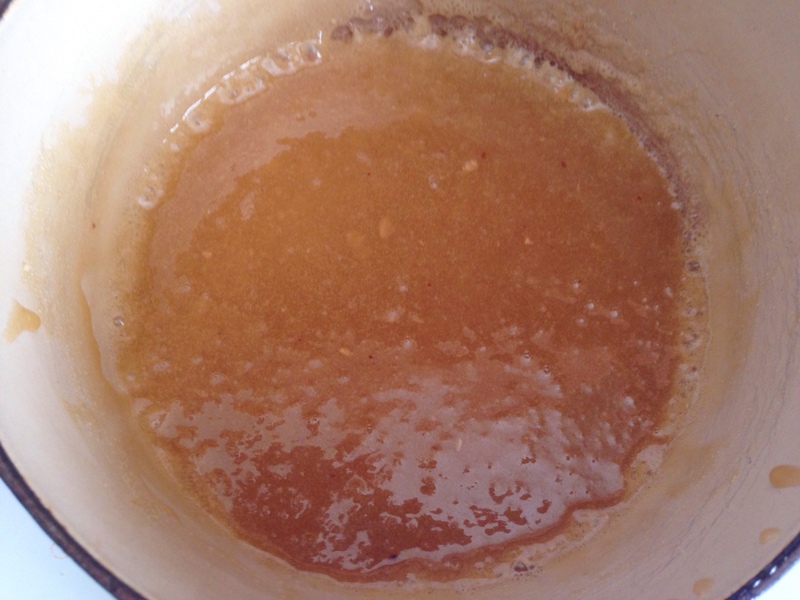 Make sure the entire pot does not bubble or the caramel will not work well for the batter. When the sides start to bubble, turn of the heat and add the vanilla extract and mix through. The alcohol in the extract will cause the mixture to bubble a bit which is fine. Pour the hot caramel into the dry ingredients and mix through. Pour the hot caramel into the dry ingredients and mix through. Line two baking sheets with parchment paper. Preheat the oven to 350° and place two racks in the oven. When the batter is cool enough to handle spoon 1-teaspoon size balls on a baking sheet leaving plenty of room (about 3 inches) for the cookies to spread out while cooking. I do 6 cookies on a sheet and cook 2 sheets at a time. The sheet placed on the lower rack cooks faster than the upper rack so after 4 minutes, move the top baking sheet to the lower rack and the bottom baking sheet to the upper rack and bake for another 4 minutes. 8 minutes should be enough for the cookies to get golden brown. If your oven is a bit slower then keep the cookies in for 10 minutes but make sure they do not burn. When you take the cookies out of the oven, some of them may have run into each other. Use a knife and gently separate the batter. The cookies are very amenable while they are on the hot baking sheet so you can also use the knife to create more perfect shapes if you wish. Remove the cookies on the parchment paper to a cooling rack or cutting boards to cool, they will cool almost immediately once removed from the hot pan. Repeat until batter is finished. Once all the cookies are baked, heat the chocolate in a double boiler until melted. Pair the cookies up as best as the shapes can match and line them up on parchment paper with the bottom side of the cookie facing up. Spread one of the matched cookies with the chocolate. 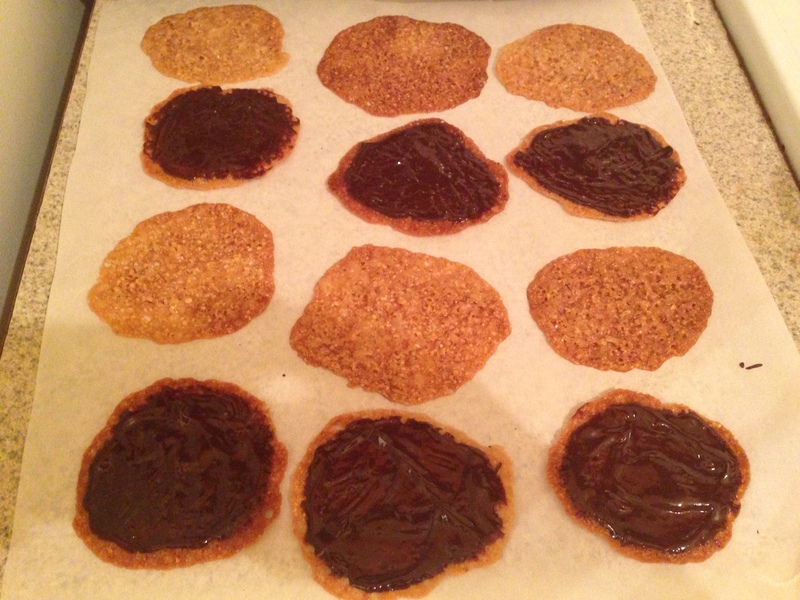 Since the lace cookies have lots of holes, some of the chocolate will drip the drip through onto the parchment paper. Place the matching cookie on top with the bottom side down on the chocolate. Place the parchment paper with the filled cookies on a baking sheet and place in the freezer for 5-10 minutes to set the chocolate. Repeat with remaining cookies and add them to the tray in the freezer. When you are done making all the cookies, store the cookies in a freezer-proof bag or container and take them out right before serving. This will keep he chocolate form melting through the cookie. Process oats until fine and add to a large bowl. 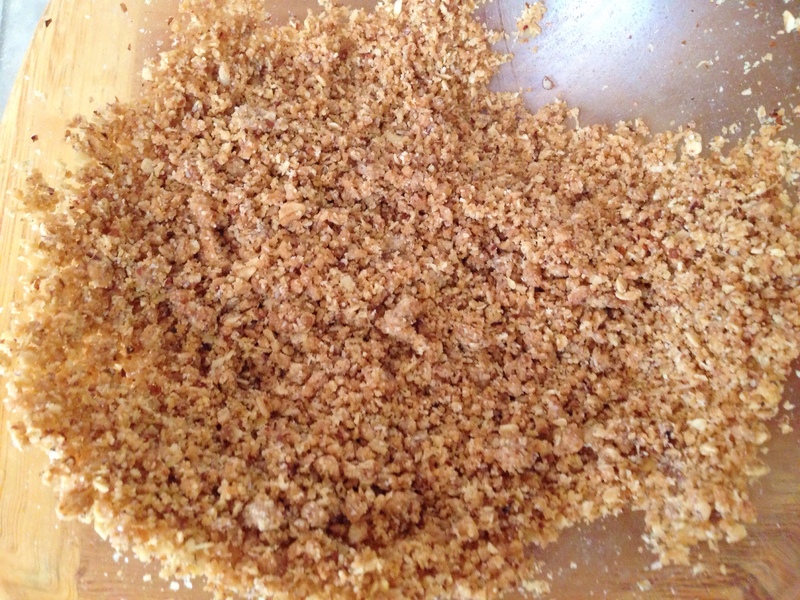 Add the almond meal and salt and mix through. Melt butter, brown sugar, sugar and cream in a heavy pot over medium heat. Cook, stirring constantly, until almost a boil, when the sides start to bubble but make sure the whole pot does not bubble. Remove from heat, add vanilla extract and mix through, then pour into dry ingredients and mix through to form the batter. Preheat oven to 350° and place two racks in the oven. 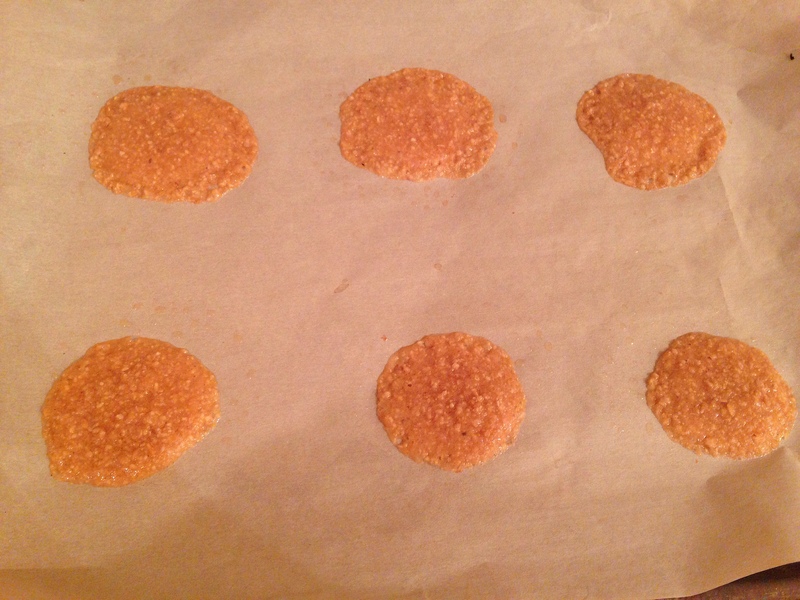 Place 1 teaspoon-size balls on parchment paper-lined cookie sheets – 6 on a tray about 3 inches apart. Bake for 4 minutes and rotate baking sheets and cook for another 4 minutes and check for doneness. Bake for 8-10 minutes in total when cookies are golden but not too brown. Remove the cookies on the parchment paper to a cooling rack or cutting boards to cool. Repeat until batter is finished. Once all the cookies are baked, heat the chocolate in a double boiler until melted. 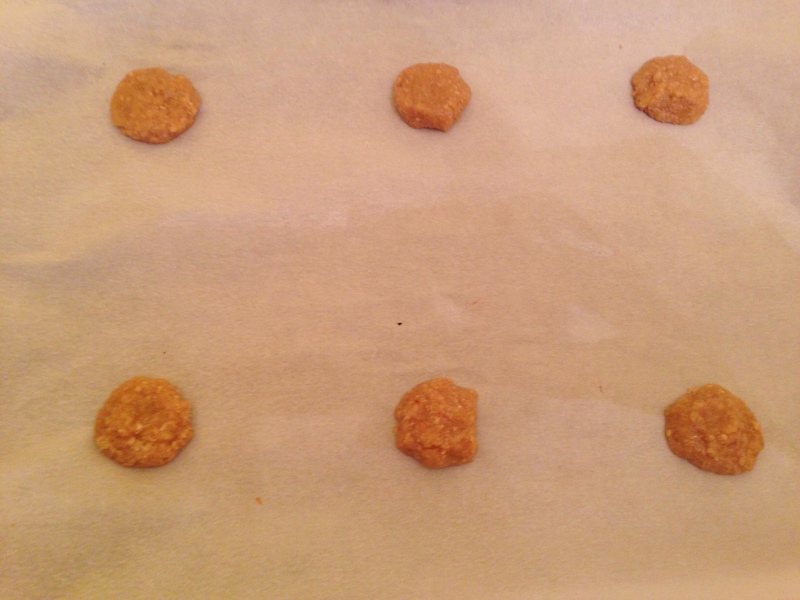 Pair the cookies up as best as the shapes can match and line them up on parchment paper with the bottom side of the cookie facing up. Spread one of the matched cookies with the chocolate. Place the matching cookie on top with the bottom side down on the chocolate. Place the parchment paper with the filled cookies on a baking sheet and place in the freezer for 5-10 minutes to set the chocolate. Repeat with remaining cookies and add them to the tray in the freezer. When you are done making all the cookies, store the cookies in a freezer-proof bag or container and take them out right before serving. 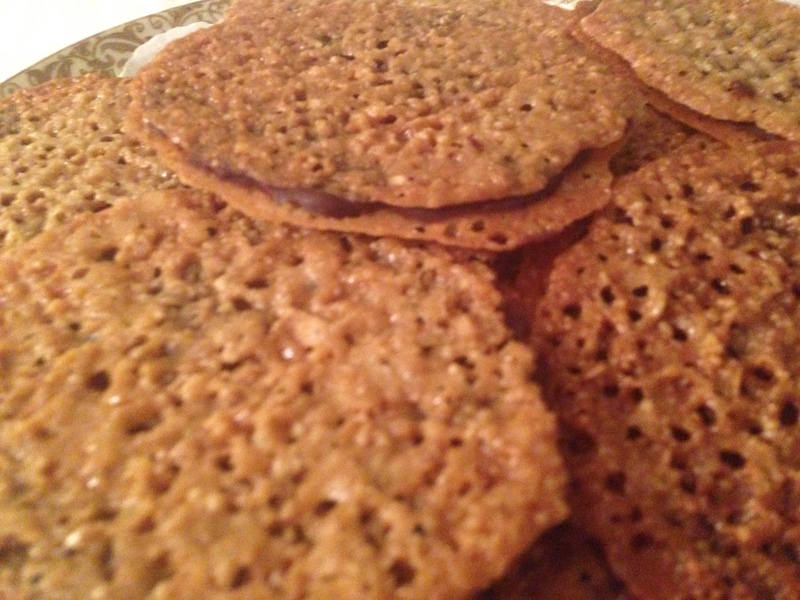 This entry was posted in Blog, Recipes and tagged Cookies, gluten free, Lace Florentine on November 1, 2014 by Leslie.